Following a critically lauded run in Chicago during Summer 2016, SpongeBob SquarePants will open on Broadway at The Palace Theatre (1564 Broadway - Broadway at 47th Street) this Fall. Preview performances begin Monday, November 6th with an official opening on Monday, December 4th. “We are very happy to welcome Nickelodeon and SpongeBob SquarePants to Broadway. The Palace is the perfect size and scale for this new musical, and we couldn’t be more thrilled to open our doors to it.” SpongeBob SquarePants cast will include Ethan Slater as SpongeBob SquarePants, Gavin Lee as Squidward, Lilli Cooper as Sandy Cheeks and Danny Skinner as Patrick. The full cast will be announced at a later date. A legendary roster of Grammy Award winners. A visionary director and Tony Award®-winning design team. One of the world’s most beloved and unforgettable characters. Turn them all loose on Broadway and what do you get? SpongeBob SquarePants! Acclaimed Steppenwolf director Tina Landau and the groundbreaking designers behind Fun Home, Hedwig, and Spring Awakening have brilliantly reimagined Bikini Bottom for the Broadway stage, bringing the spirit of SpongeBob to life with humanity, heart, and pure theatricality. With an original score from some of the biggest names in pop and rock, SpongeBob SquarePants explodes with energy. SpongeBob SquarePants is a musical production conceived and directed by Tina Landau, book by Kyle Jarrow, orchestrations, arrangements & music supervision by Tom Kitt, with choreography by Christopher Gattelli. The design team includes scenic and costume design by David Zinn, lighting design by Kevin Adams, projection design by Peter Nigrini, sound design by Walter Trarbach, hair and wig design by Charles G. LaPointe and casting by Telsey + Company/Patrick Goodwin, CSA. 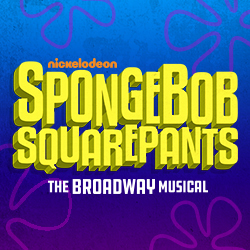 Nickelodeon and Sony Masterworks Broadway have recorded the cast album of SpongeBob SquarePants and will announce its release shortly. SpongeBob SquarePants will be produced by Nickelodeon with The Araca Group, Sony Music Masterworks and Kelp on the Road. Tyler and Joe Perry of AEROSMITH, Sara Bareilles, Jonathan Coulton, Alexander Ebert of Edward Sharpe & The Magnetic Zeros, The Flaming Lips, John Legend, Lady Antebellum, Cyndi Lauper, Panic! At the Disco, Plain White T’s, They Might Be Giants and T.I., and a song by David Bowie. With additional lyrics by Jonathan Coulton. Based on the property, The SpongeBob Movie: Sponge Out of Water, in 2015 at #1 opening weekend. A third feature has been announced for 2019, timed to the series’ landmark 20th anniversary. The character-driven cartoon chronicles the nautical and sometimes nonsensical adventures of SpongeBob, an incurably optimist and earnest sea sponge, and his undersea friends.